Downton Abbey returned for its fourth season last night, and no one seemed happier about it than black Twitter. According to The Root’s Chatterati, Sunday night’s broadcast was the third-most-tweeted topic by black Twitter during the show’s two-hour premiere. So how did black folks get so obsessed over this 1920s British period drama, which introduces its first black character this season? Could it be the fan favorite Dowager Countess—or, as Twitter user @sk8j calls her, “Dowager Mic Dropper”—who reminds us of a smack-talking granny who schools her family whenever they show out (looking at you, Lord Grantham)? Or is it the crazy downstairs drama—the scheming valet, Thomas; the dopey, lovelorn kitchen maid Daisy; or lovebirds Anna and Bates, whose romance always seems to hit a bump or two along the road? 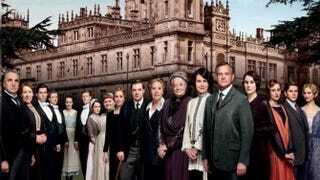 We wanted to know why black people love this show so much, so we decided to introduce the hashtag #BrowntonAbbey. Hit us up on Twitter and tell us why you watch.